Since your scuba gauge maintenance remains attached to your regulator, simply rinsing and soaking it along with your scuba regulator takes care of its maintenance. When you take your regulator in for its annual maintenance, be sure to have your dive shop take care of your scuba gauge at the same time. Whether we talk about your scuba gauges or any dive computers, remember that they are precision instruments and need to be handled with care. Try not to pack your gauges in a spot where it could be damaged because of heavy weight on top. I have seen many airports and dive boats stack gear bags on top of one another and damage the gear at the bottom. I suggest carrying your regulator and gauges in a carry on bag. Send some extra time making sure the compass rotates easily. Sometimes on beach dives the sand can get between the rotating bezel and the compass and jam the bezel in place. If a warm soak does not solve a jammed bezel, try rotting the bezel back and forth to break the sand grain free. 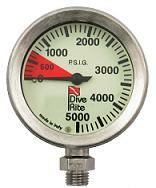 Remember to use spray silicone and not a petroleum based products on your scuba gauges.